87 Nm (64 lb-ft) @ 7,750 rpm. The power/torque values indicated are measured using an engine dynamometer according to homologation regulation and they correspond to the homologated data, as quoted in the Bike Registration Document. Electronic fuel injection system, 53mm throttle bodies with full Ride by Wire. Stainless steel muffler and aluminium and cap; lightweight 2-1 system with catalytic converter with 2 lambda probes. 2 x 320mm semi-floating discs, radially mounted Monobloc Brembo M4-32 callipers, 4-pistons, axiial pump with ABS as standard. 245mm disc, 2-piston floating calliper with ABS as standard equipment. 179.5kg (395.7lb). Weight data refers to the dry weight of the motorcycle without battery, lubricants and coolants for liquid-cooled models. 205.5kg (453lb). Kerb weights indicate total bike weight with all operating consumable liquids and a fuel tank filled to 90% of capacity (as per EC standard 93/93). Riding modes,Power modes, DSP Ducati Safety Pack (ABS + DTC), RbW, seat cover passanger handles, ready for anti-theft system and DDA. The Testastretta 11° 821 cc engine generates power equal to 80 kW (109CV) @ 9,250 rpm and 87 Nm (8.9kgm) of torque at 7,750 rpm. 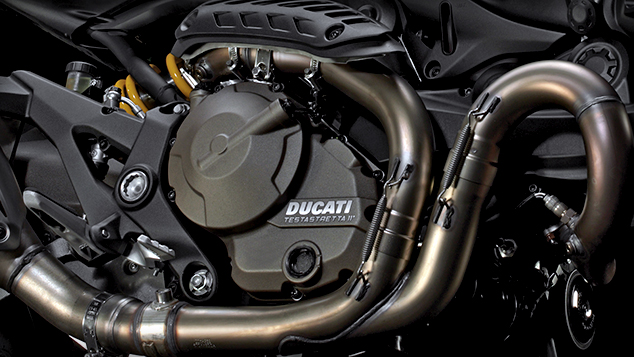 The Monster’s 17.5 L fuel tank is an integral part of the bike’s overall design. 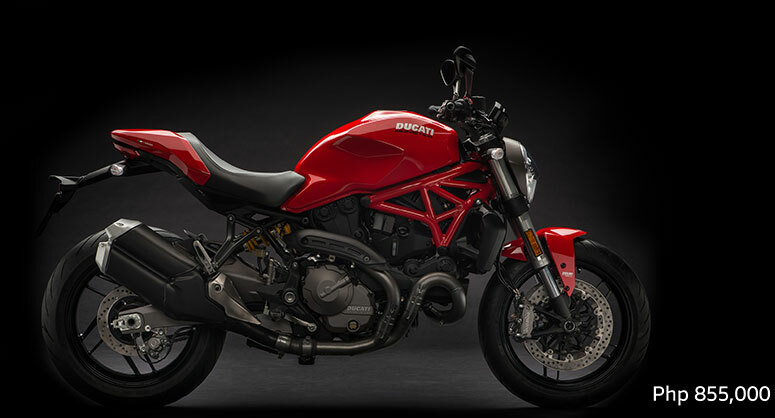 The distinctive fuel tank, pure “Monster” in style, completes the Monster’s strong, unmistakable silhouette, while its metal structure and sculpted knee panels give the bike a feeling of solidity. The encased tail light is fully LED. Take the Monster one step beyond its iconic design with three different kits to personalise your motorcycle. Each specific pack is conceived to enhance your riding experience and includes design elements to suit your preferred style. 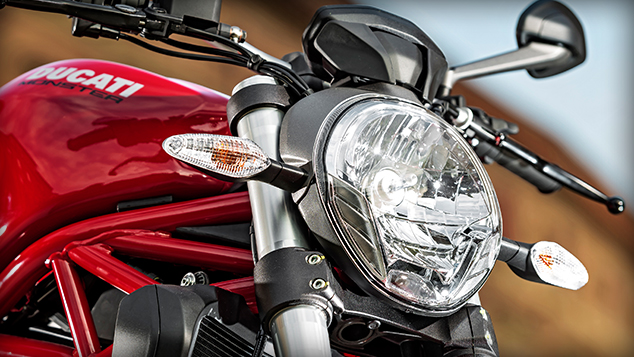 Highlight your Monster and express your personality with one or more of the available packs: Sport, Touring and Urban.